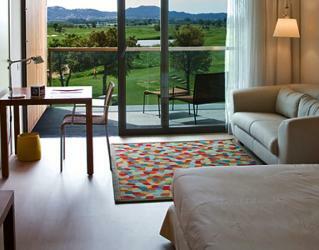 DoubleTree by Hilton Hotel & Spa Emporda is located right in the heart of Costa Brava; one of the best golf destinations in Spain. 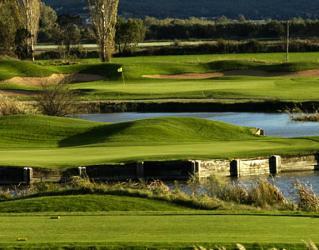 The 4* boutique hotel offers an unforgettable golf holiday experience by combining a delightful stay, great facilities, nearby local attractions with superb golf courses on its doorstep. 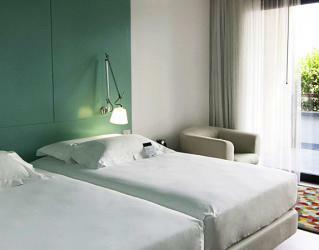 The warm welcome on your first step in the hotel heralds the upcoming blissful days. The hotel has well-appointed rooms and suites, all featuring a balcony with beautiful views of the Montgri Mountains or the golf course. Contemporary and stylish in design, the spacious guestrooms cover all the essentials to make the guests feel at home, including; air conditioning, LCD TV, internet access, remote printing from any guestroom, laptop-sized safety deposit box, minibar, Sweet Dreams by DoubleTree sleep experience, alarm clock radio with MP3 connectivity, in-room coffee from The Coffee & Tea Leaf and CITRON Honey & Coriander by Crabtree & Evelyn Bath Products in the bathroom. 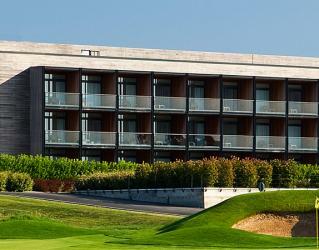 Emporda Golf Restaurant is at your service from morning to late evening with a fusion of Spanish and Catalan cuisine. Flooded with natural light, the modern and stylish Restaurant Tramuntana offers exquisite flavours of the Mediterranean cuisine in a relaxed atmosphere. The innovative dishes here created by Chef Guillem Lama will be a feast. The Lobby Bar and Lounge Club serve cocktails and drinks. During summer months the Lounge Club is moved to the garden area where a relaxed ambience awaits the guests. Please note that the availability of restaurants and bars may change seasonally. 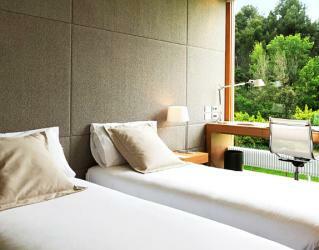 The wellness centre at the hotel offers relaxing moments in a tranquil atmosphere. Indulge in the refreshing offerings of the thermal circuit or one of the treatments to reward yourself after a tiring day on the golf course. The relaxing spa centre covers solarium, heated swimming pool, Jacuzzi, cascade for back and neck muscles, lumbar jets, sauna, Turkish Bath and Nebulising, Knippe (circulation) and Scottish showers. The fitness centre on the ground floor of the hotel offers an airy indoor setting filled with natural light thanks to the floor to ceiling windows; making you feel you do your exercise outdoors. There is an endless option of activities nearby Costa Brava, including Salvador Dali Museum in Figueres, Roman and Greek villages, DO Emporda wine route, Illes Medes Natural Park in l’Estartit, hiking and biking greenway routes, Segway, Quads, Kayak, Parachuting, diving, Golf and a unique dining experience at the best restaurant of the world with *** Michelin, El celler de Can Roca. 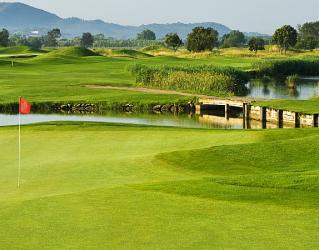 Located in the heart of the Costa Brava, Emporda Golf course has 36 holes, giving you a choice of 6 different course combinations. Our TOP 10 PGA - Von Hagge, course (1st nine holes of the Links course combined with the 1st nine holes of the Forest) is our personal favorite. 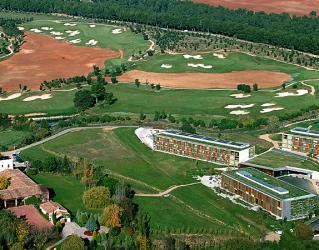 Emporda Golf Forest winds through a traditional Mediterranean pine forest that protects players on days when the wind is up. 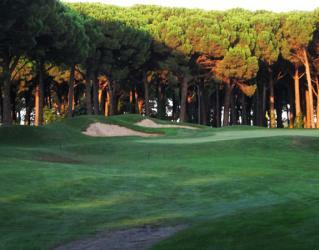 winds through a traditional Mediterranean pine forest that protects players on days when the wind is up. 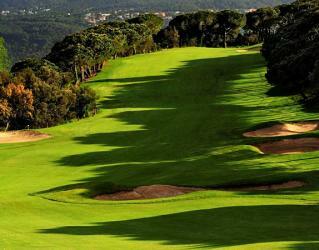 The natural surroundings give one a sense of peace while practicing the noble sport of golf.